In the world of 3D printing beyond plastic is a major player. 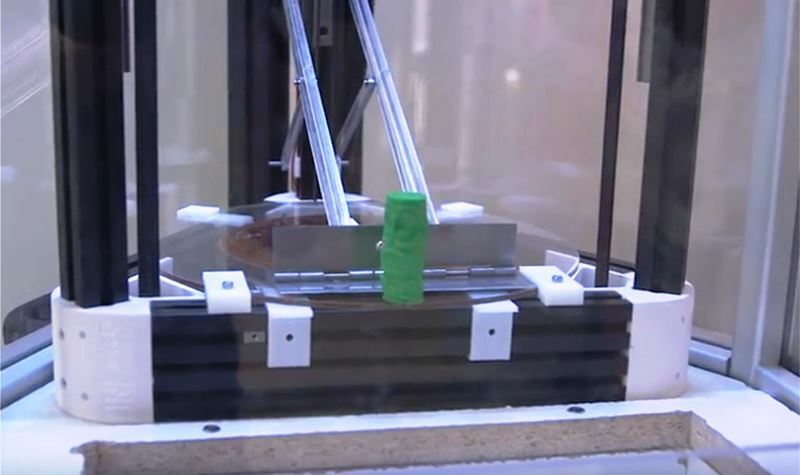 Here at Virginia Tech, they’ve even built a 3D printing vending machine. Students can order up a part for a design project and out pops the finished product. Engineers call it additive manufacturing. In additive manufacturing, we actually are adding material to create the shape that we want,layer-by-layer. One layer at a time, starting from the bottom, and working our way to the top. But, what will it take to move technology like this into the manufacturing big time? Move over plastic. It’s time to print something, well, a lot harder – metal. What we’re doing that’s different is that we’re printing copper. It’s a really tricky metal to create. With support from the National Science Foundation, mechanical engineer Chris Williams and a team are developing a low cost, energy efficient way to 3D print complex copper parts. Copper is an excellent conductor of heat and electricity, and is widely used in electronics. Traditionally, manufacturers start with a block of copper and machine it down to form to the desired part. Additive manufacturing does the opposite – laying down copper to build up a precision shape. The process starts with a jar of copper powder. So, we’re jetting glue into powder. This printer works like a traditional ink jet printer, but instead of printing ink onto paper, it prints glue into the copper powder. We’re working with a process called binder jetting. In that process, you’re using an ink jet head to actually selectively jet glue into a bed of powder, one layer at a time. Once the part is created in that fashion, we then take it to a furnace to then sinter or fuse the particles together to make the metal part. So as a result, we’re sort of separating the creation of the product from the heat that’s required to make a dense product. But is an additive manufactured part as good as a machined one? Not yet. The printed part contains tiny pockets of air that can reduce performance. Williams is looking to add powdered copper nano particles to the glue to fill in those tiny spaces and gaps. Which would, we hope, improve its sintering performance and its mechanical performance and its electric conductivity. This process will be ready for wide spread use within five years. We hope that we’ll be able to share these results, and enable engineers and designers to design new copper products for energy applications, thermal applications, structural applications with any kind of complexity that you can imagine. Next-generation manufacturing, printing up everything from solar panels to jet engine parts. The sky’s th elimit to what might one day roll off these presses. For Science Nation I’m Miles O’Brien.